Previous Story: Global Water Crisis? "Count Lev Nikolayevich Tolstoy," Rosh started speaking, as father and son started walking together on their daily walk, "also popularly known as Leo Tolstoy, was a Russian writer, philosopher and political thinker." "His contemporaries Fyodor Dostoyevsky thought him to be the greatest of all living novelists, and Anton Chekhov paid him lofty tributes." "Is Count like a Prince, Pa?" asked Josh. "It is Titled Nobility," agreed Rosh. "Russian nobility arose in the 14th century and made up most of the Russian government until the 1917 February Revolution." "Nobility was transferred by inheritance if you were born in an ancient noble family or bestowed upon you by a higher authority, if you weren't." "Titled nobility was highest in the hierarchy, with titles such as Prince, Count and Baron." "In later Imperial Russia, higher ranks of state service were automatically granted nobility, but it was not necessarily associated with land ownership." "So, a Baron or Count could be either proprietary or actual, which meant they actually owned land in the Russian Empire, or just titular, meaning they only had the title but no land." "Tolstoy was born in 1828 in Yasnaya Polyana, the family estate in the Tula region of Russia. So, the Tolstoys were a well-known family of old Russian nobility." "Interestingly, Tolstoy's teachers described him as 'both unable and unwilling to learn'. Yet, today he is widely considered as one of the world's greatest novelists." "Almost 150 years after it was first published, his novel War and Peace still ranked as first in this year's Newsweek list of the Top 100 Books. I also saw it listed at number 20 on the BBC survey The Big Read, a few years ago." "His own life was every bit as interesting as his books. In 1862, Tolstoy married Sophia, who was 16 years younger than him. They had thirteen children, but their marriage was a meeting of two bodies rather than of two minds." "On the eve of their marriage, Tolstoy reportedly gave her his diaries detailing his extensive sexual past, and the fact that one of the serfs on his estate had already borne him a son." "Why did he do that?" Josh was shocked. "A lifelong relationship like marriage, has to be based on truth, trust and integrity," answered Rosh. "Partners have the right to know who they are marrying, before they marry each other. But even truth, must not be given to unworthy recipients." "It should be given only to someone who has the guts to digest it, live with it, with understanding and without resentment. Virtues like Integrity and Truth are wasted on someone who does not value them, is of a suspicious nature, or is unable to forget or forgive." "Unfortunately, Tolstoy's forthrightness backfired and sowed the seeds of rancour in his married life. Their later life together was described by A. N. Wilson as one of the unhappiest in literary history." "In his stories too, Tolstoy tried consistently to realistically convey the Russian society in which he lived. This urge for honesty, which destroyed his personal conjugal bliss, however vaulted him into the annals of history and made his stories legend." "The Cossacks (1863) described the Cossack life and people through a story of a Russian aristocrat in love with a Cossack girl." "Anna Karenina (1877) told parallel stories of an adulterous woman trapped by the conventions and falsities of society, and of a philosophical landowner (much like Tolstoy), who worked alongside the peasants in the fields and sought to reform their lives." "War and Peace was first published in its entirety in 1869, although portions of an earlier version of this novel, then known as The Year 1805, were serialized in the magazine The Russian Messenger between 1865 and 1867." "It was a story on a wide canvas. It had 580 characters, many historical, others fictional. It began in the year 1805 during the reign of Russia's Tsar Alexander I and led up to the battlefields of Austerlitz and Borodino in the 1812 French invasion of Russia by Napoleon." "It followed the life and times of five aristocratic families in Russia and three of the most well-known characters in literature today: Pierre Bezukhov, the illegitimate son of a count who was fighting for his inheritance and yearning for spiritual fulfillment; Prince Andrei Bolkonsky, who left his family behind to fight in the war against Napoleon; and Natasha Rostov, the beautiful young daughter of a nobleman who intrigues both men." "As Napoleon's army invaded Russia, Tolstoy brilliantly followed characters from diverse backgrounds - peasants and nobility, civilians and soldiers - as they struggled with the problems unique to their era, their history, and their culture. The novel explored Tolstoy's theory of history, and in particular the insignificance of individuals such as Napoleon and Alexander." "Based on the principles he described in his 1862 essay The School at Yasnaya Polyana, Tolstoy pioneered democratization of education by founding 13 schools in Yasnaya Polyana for his serfs' children. But his educational experiments were short-lived, partly due to harassment by the Tsarist secret police." "In 1869, he came upon Arthur Schopenhauer's The World as Will and Representation. The Hindu Buddhist ascetic morality upheld in this 1818 German work gradually metamorphosed Tolstoy, cementing his view that renunciation was the proper spiritual path for the upper classes." "The Russian nobleman chose poverty and formal denial of the will, as passages on these, which abound in Schopenhauer's ethical chapters, had a lasting influence on his psyche and thought. Here is a famous passage:"
But this very necessity of involuntary suffering (by poor people) for eternal salvation is also expressed by that utterance of the Savior: 'It is easier for a camel to go through the eye of a needle, than for a rich man to enter into the kingdom of God'. Therefore those who were greatly in earnest about their eternal salvation, chose voluntary poverty when fate had denied this to them and they had been born in wealth. Thus Buddha Sakyamuni was born a prince, but voluntarily took to the mendicant's staff; and Francis of Assisi, the founder of the mendicant orders, who as a youngster at a ball, where the daughters of all the notabilities were sitting together, was asked: "Now Francis, will you not soon make your choice from these beauties?" and who replied: "I have made a far more beautiful choice!" "La povertà (poverty)": whereupon Francis abandoned everything shortly afterwards and wandered through the land as a mendicant. "Tolstoy began actively seeking to reject his inherited and earned wealth, including the renunciation of the copyrights on his earlier works. In 1884, he wrote a book called 'What I Believe', in which he openly confessed his Christian beliefs. He was particularly influenced by the Sermon on the Mount, and the commandment to turn the other cheek to evil." "His doctrine of pacifism and ideas on nonviolent resistance, expressed in such works as The Kingdom of God Is Within You (1894), were to have a profound impact on pivotal 20th-century figures like Mohandas Karamchand Gandhi, Martin Luther King, Jr., and James Bevel." "In 1908, Tolstoy wrote A Letter to a Hindoo, outlining his belief in non-violence as a means for India to gain independence from British colonial rule. In October 1909, a copy of this letter fell into the hands of Mahatma Gandhi, who was working as a lawyer in South Africa at the time." "Tolstoy's letter was significant for Gandhi, who wrote to the famous writer, seeking proof that he was the real author, leading to further correspondence between them. 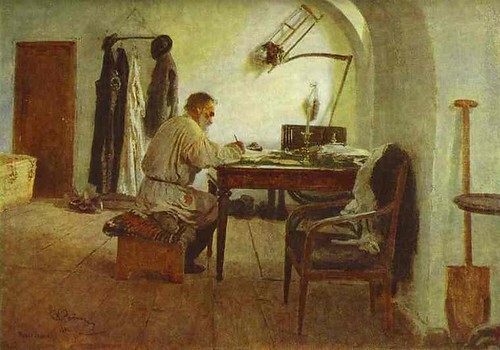 This correspondence lasted only a year, as Tolstoy died in November 1910, at the age of 82." "But Gandhi acknowledged Tolstoy's influence in his autobiography, calling Tolstoy 'the greatest apostle of non-violence that the present age has produced'. He also named his second ashram in South Africa, the Tolstoy Colony." "The two men also shared a common belief in the merits of vegetarianism, the subject of several of Tolstoy's essays. Tolstoy also opposed private property, the institution of marriage and valued the ideals of chastity and sexual abstinence (discussed in Father Sergius and The Kreutzer Sonata), ideals also held by the young Gandhi." "By directly influencing Mahatma Gandhi with his ideas, Tolstoy helped shape India's nonviolent resistance movement. Would you like to hear a famous Tolstoy short story, to get a glimpse into this great man's mind?" Josh nodded silently, but a fat crow above him couldn't contain himself any longer. He crowed loudly in assent.